Febuary 22nd 2014 Over the weekend the junior club had a super fun meeting to plan for the year. Not only did we have some great ideas for this year, we decorated some horse shaped cookies. Some of the ideas we have for the year will include horse costume contest, visiting a horse rescue, outdoor movie night and helping out at Fellowship Farm’s schooling shows. The next meeting will be held on March 22, where we will work in braiding and mane pulling! We hope to see you there! We were extremely fortunate to have Dr. Boyer and Dr. Golden from Carolina Equine Hospital speak at our meeting on October 12th. Joining us were members from a 4-H group. Their presentation focused on first aid as well as situations which would require a veterinarian. This talk was interactive the audience was able to ask questions as well as answer questions from Dr. Boyer and Dr. Golden. At the conclusion of the whole group presentation we divided into small groups and practiced bandaging a leg and foot. These are one of the most common injuries for our equine partners and require immediate attention. All of the participants learned valuable information and were grateful to Dr. Boyer and Dr. Golden for their time and expertise. 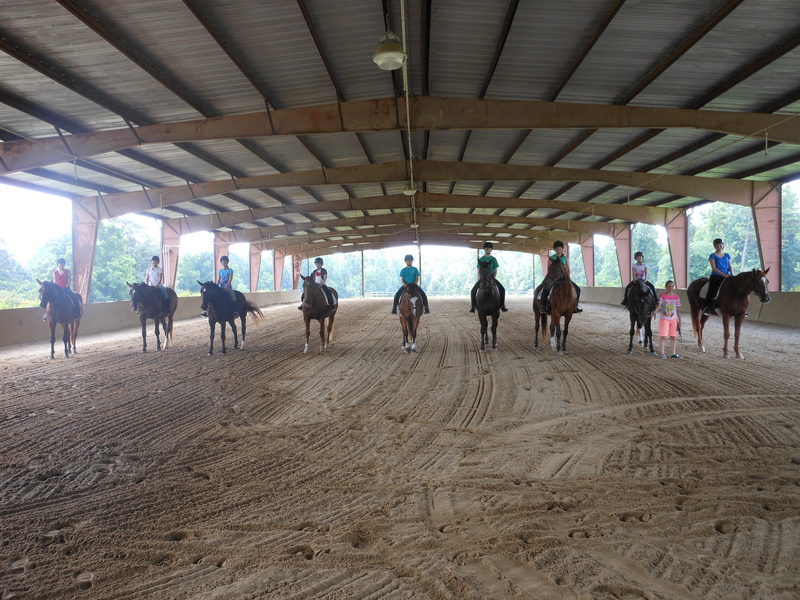 It was a spectacular summer day for our mounted meeting on Saturday, July 20th we had nine members attend. The meeting began with our group going to the fields to bring in the horse they would ride. 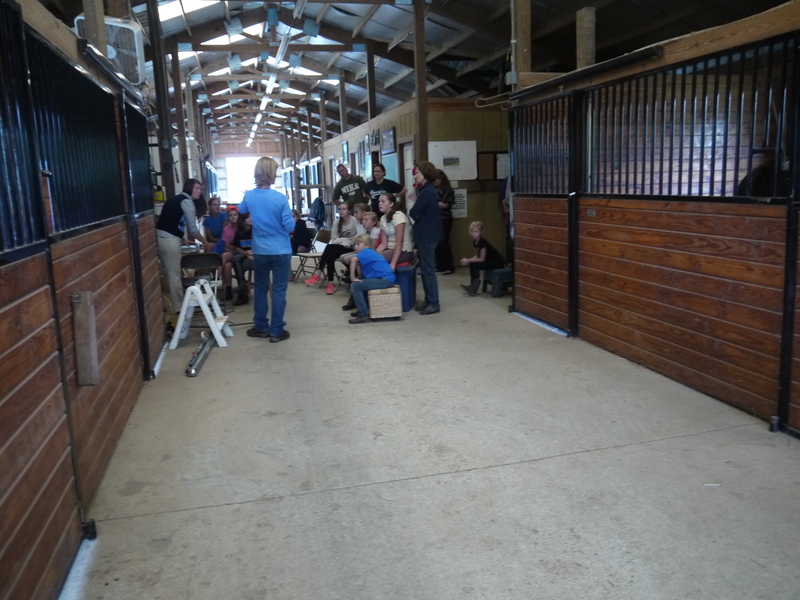 Each rider had to groom their horse and tack them up for the lesson we all met in the covered arena for introductions. At the conclusion of the introductions, everyone had an opportunity to express a riding goal. We were extremely fortunate to have three instructors, Miss Tami, Miss Katelyn and Miss Alicia. The riders were divided into small groups according to their experience. This provided everyone a chance to work on the goal they set for the lesson. At the conclusion, each horse was showered and prepared to return to the fields. The riders enjoyed drinks and popsicles as well as a discussion about the Junior competition in Kentucky. Everyone left feeling proud of what they had accomplished during their ride. The NCDCTA Junior Club CU@X which meets at Fellowship farm is open to anyone with an interest in horsemanship and riding. We welcome new members. Come and join us and have some fun! Do you love everything about horses? Are you between 7-21 yrs. old? Then we have an event for you! Saturday, November 17th at 11:00am Fellowship Farm in Greensboro, NC will host the first annual NCDCTA sponsored Research Fair. All 9 Jr. 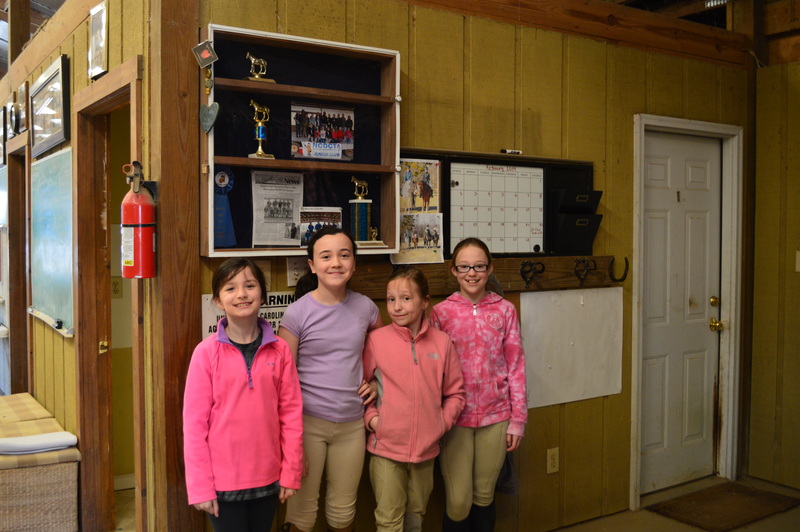 Chapters will come together to present their selected topics about horses. This event is open to the public and especially welcomes any and all children who have a passion for being around horses and who have a desire to learn proper horse skills. 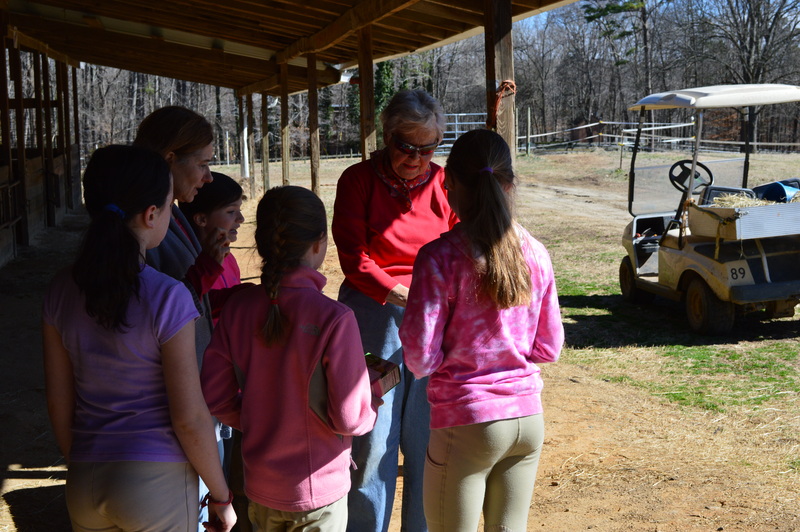 The North Carolina Dressage and Combined Training Association (NCDCTA) under the direction of Kris Daniel, a board member, Colleen Blackwelder and Jeanene Smith both members of the Jr. Club committee, had a vision to broaden the membership to include young people ages 7-21 thus Junior Chapters were formed. These chapters come together to share their love of horses and through the direction of coaches they are learning new skills. 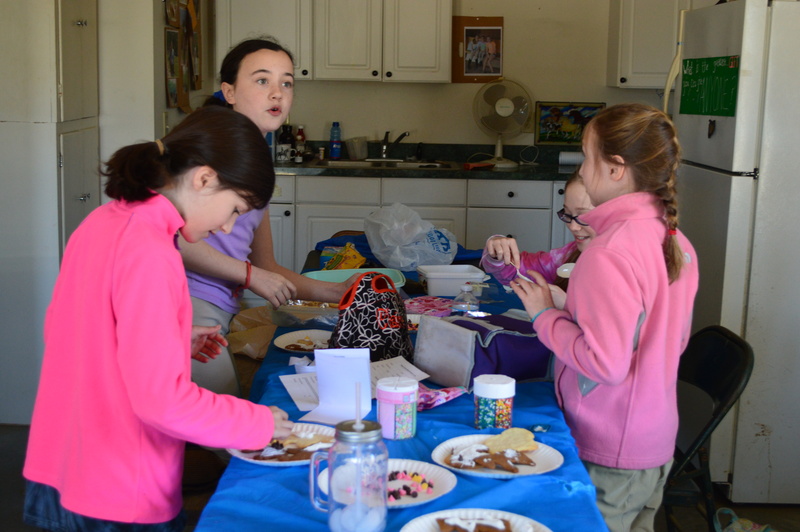 In addition, many of the Junior Chapters participate in local community service projects such as; volunteering for Special Olympics and Crop Walk, as well as raising funds to help needy horses in Guilford County. This is a free event and will be held rain or shine as we will be in a covered arena. 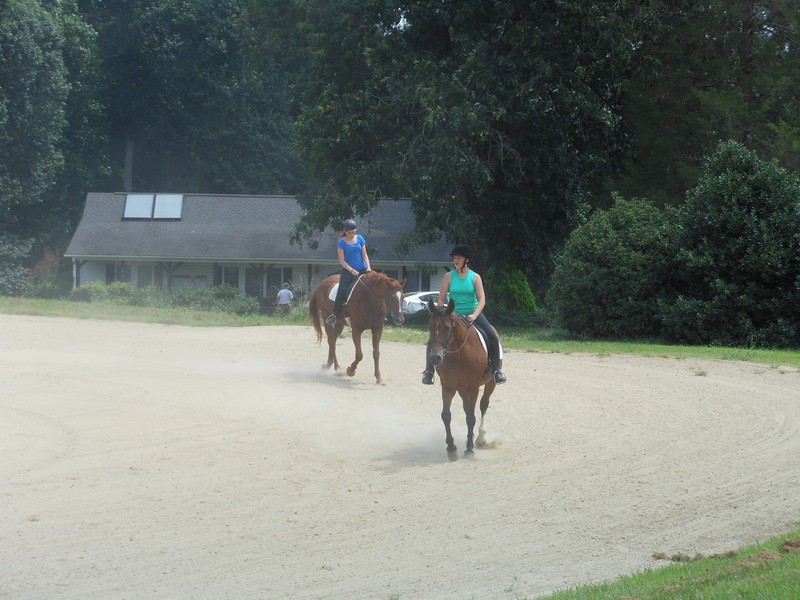 You don’t have to own a horse or be a rider, just be our guests, enjoy the fun and meet new friends. You too can experience the magic that horses bring into our lives. Fellowship is located at 4820 Thacker Dairy Rd. Greensboro, NC 27406. The event starts promptly at 11:00 and will be open to the public until 1:00. There will be a special presentation from a well known young equestrian, Kenny Kerin following the research fair. Any updates will be posted at http://www.fellowshipfarm.net or http://www.NCDCTA.org. We hope to see you! Just wanted to drop a note about the show and how absolutely proud I am of each and every one of you! Great job to everyone who participated in the show and to everyone who helped out in any way! You all did a great job and I hope you were very pleased with yourselves. Thank you to Deborah, Kaitlyn, Vivian, Sophie, and our new member Isla for all of their help at the concession stand! Congratulations to Sophie for winning the Sportsmanship Award! After helping out at the stand, volunteering to clean up, and being available to help whoever needed it, Sophie was very deserving of the award. Congratulations again!! And for what we’ve all been waiting for…the amount of money raised at the concession stand was $107.66!! 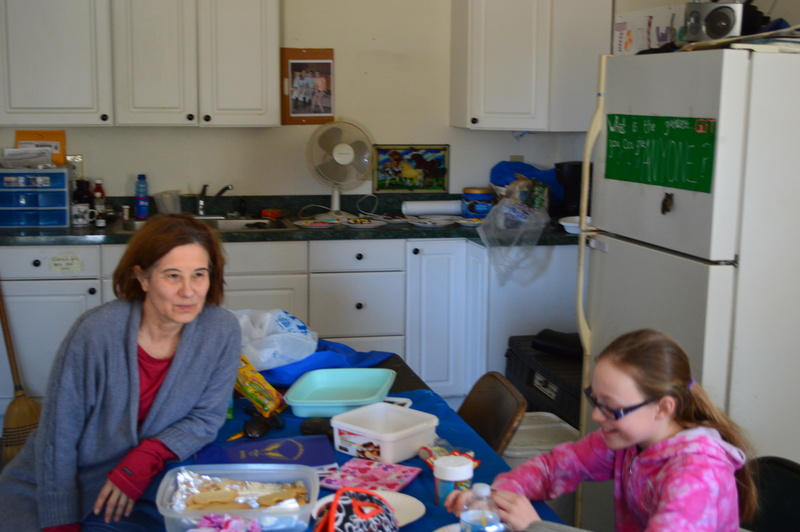 Thank you to Mr. and Mrs. Bell for the hot chocolate, coffee and coffee maker; Bubbles’ mom for the doughnuts; Ben’s mom for the sticky buns; Halle’s mom for the sugar cookies; Vivian and her mom for the chocolate chip cookies, sugar, coffee creamer, and hot tea; Ally and her mom for the brownies; Deborah for the muffins; Isla and her mom for the pound cake; and Sophie and her mom for the hot chocolate and hot water containers. I don’t think I forgot anyone, but if I did, THANK YOU!! Everyone helped make this a HUGE success and I am so grateful. Up next is deciding what research project we will do as a club. I’ll be in touch. A big thank you to everyone who was able to make it to our last meeting. I hope you all had a great time learning about braids and mane-pulling. Everyone did a FABULOUS job, and the horses looked so nice! Thank you to all who were able to donate money for the farrier. We raised more than enough, so we have started a nice little treasury! In other news, there are NCDCTA shirts that are available for purchase. They are $10 each, and junior club members and advisors get to wear green shirts, while nonmembers will wear white. There needs to be some sort of distinction between members and nonmembers at shows. If you’re interested in buying a shirt, I’ve attached the order form. Please let me know and I will give you further instructions on how to turn the money and the form in. Lastly, the Raleigh CDI show is quickly approaching, so if you’re interested, please let me know. If you have an NCDCTA membership, please let me know. If there is anything else you need, I am an email away. I’ll be in touch about the date for the next meeting. Until then, keep up the good work and enthusiasm. I hope you all are doing well and are very excited about our meeting on February 18th from 1-3pm. At this meeting, we’ll be collecting the money for the farrier. From the last email that I sent out, it seems that 8 people will be attending the meeting. As of now, Kaitlyn, Deborah, Emma, Vivian, Caitlin, Ally, Halle, and I will be going to the meeting. Barbara will be unable to come, but wants to be counted in for payment. Based on basic division, everyone needs to bring $2.80 to the meeting to pay for the farrier. If I receive notice that more will come, the amount to bring will be lower, so if your name is not on that list, please let me know if you’ll be coming. Also, we will be working on braiding and grooming at this next meeting. 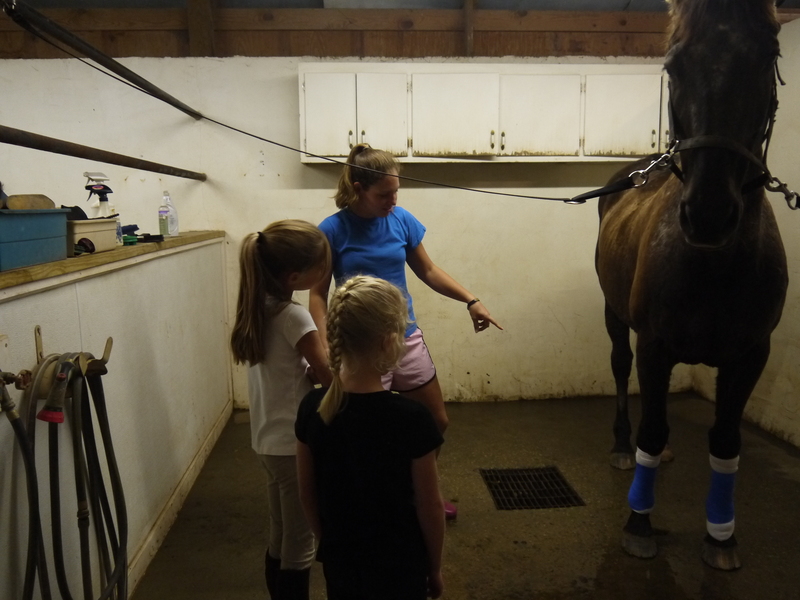 We’ll divide into groups and clean, groom, and braid to present the horses in the show ring. Be sure to bring your magical hands and tons of elbow grease! On another note, keep in mind that around the end of May there will be a show in Raleigh in which junior members may participate. If you already have your NCDCTA membership, please let me know and send me your membership number so that we can send this information in. Can’t wait to see big smiles from everyone next week! Take care! I’d like to start this off with a little note to everyone who participated in the show on Saturday, December 3rd: You all did a WONDERFUL job, and it was great to see everyone enjoying the feel of a “real horse show” as Bubbles called it. Allie, you showed fabulous sportsmanship, and the perfect ‘get back on’ mentality. Us older riders have all fallen off at one point or another, and it really is important to dust off our bottoms and get right back on, just as you did. You go, girl. Hopefully you all had a great time and are looking forward to the next show! On another note, January is quickly approaching, and with a new month comes a new meeting! Tami would like a meeting in early January, and Patrick will be unavailable on the 14th, so it looks as if the 7th will be the date of our next meeting. This is somewhat tentative, so I’ll send out the definite date soon. I asked for service project suggestions, and Halle’s mom sent in a great one. She and Halle know an older lady who owns a 24-year old horse. The lady has a debilitating back injury, and is therefore unable to do the necessary work to keep her horse’s enclosure in good shape. 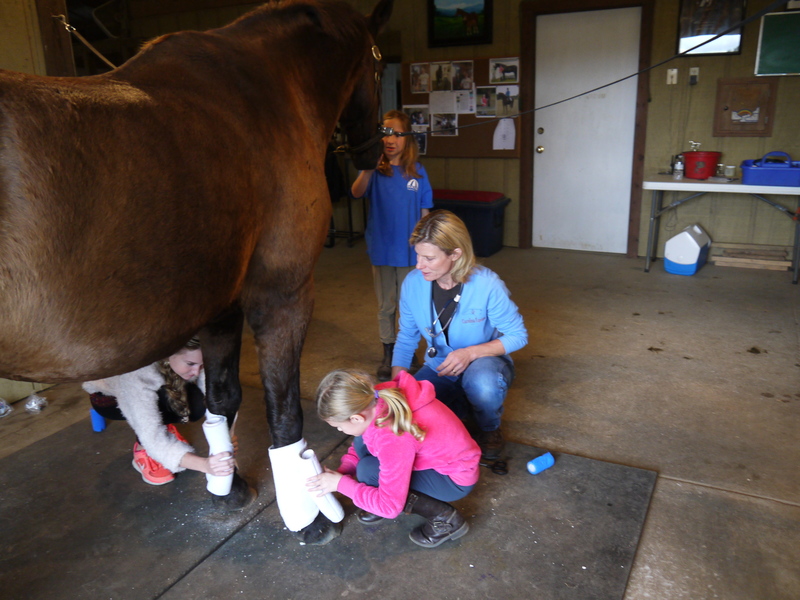 It was suggested that we as a club fundraise and assist this lady in getting the proper care for her horse. He is in need of a farrier, a vet check-up, and a bath. His pasture needs seeding and care, and it would be good to fix up his barn and watering area. This is a great way to use our love of horses to help someone in need. That’s all for now, and I’ll be in touch soon about the official meeting date. 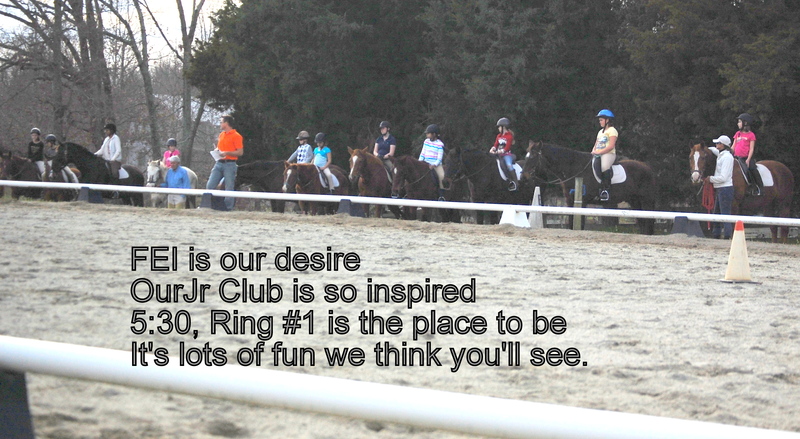 SUCCESSFUL 2nd JR. CLUB MEETING WITH GREAT RIDING BY ALL! Great riding today Jr. Club members! 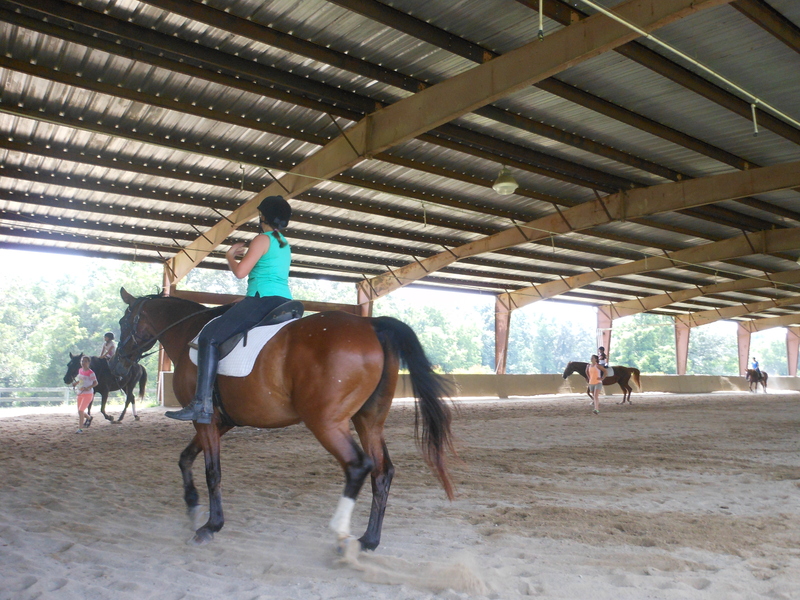 It was a treat to see all of you enjoying a horse and practicing your riding skills. Tessa, Patrick and I feel very honored to be part of such a fun group of dedicated young horse people. Thank you! The show is set for Dec. 10th and all interested in participating can email your info to patcurran@fellowshipfarm.net . For those of you that regularly ride at Fellowship, Mrs. Bell will handle getting your info to Pat. Please let her know your interest at next weeks lessons or sooner. Remember, an entry constitutes a financial commitment. For those of you who are not in our regular lesson program but would like to show, please email Tami at tamibatts@fellowshipfarm.net so I can arrange a horse and we can work out what test is best for you. We want everyone who wants to show to be able to but we have to make prior arrangements. Entry fee is $25 a class. 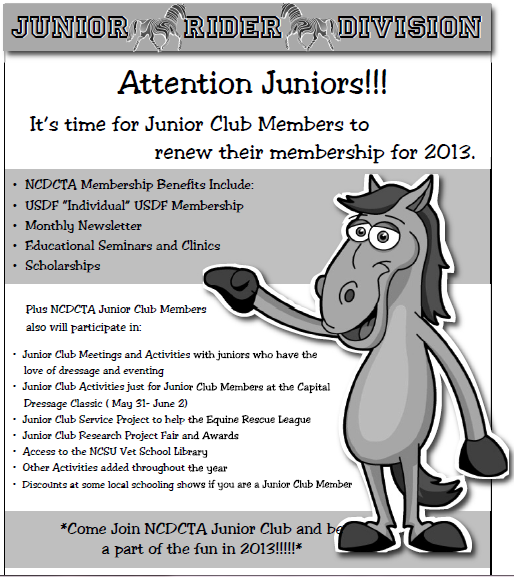 All Jr club members who have joined NCDCTA through the club for 2012 will receive a free entry into 1 class. As of Nov. 26th, the only ones I know who have joined are Halle and Kaitlyn. If anyone else has joined, please bring your NCDCTA # for verification. Patrick and I need a list of your NCDCTA #’s for our part of the paper work, so this will be a big help to us. On Friday, Dec. 9th, any Jr. club member entered in the show is welcome to come for a 30 minute practice session. You will need to come prepared to ride and have ample time to groom, tack and put away your horse properly. We will have private or semi-private sessions so we can accomplish a lot. This will be at a reduced rate of $30 per rider. This will need to be arranged ahead of time. Please contact Tami or Mrs. Bell with your interest. tamibatts@fellowshipfarm.net or Mr. and Mrs. Bell’s email is johnbell@fellowshipfarm.net . Any coaching of Jr. Club members during the show on Sat. is free of charge but will be limited to a brief period of time due to the number of times the horses will be ridden. Your ride times will be posted on Thursday evening at www.fellowshipfarm.net . If you have a time restraint, please let me know by Monday, Dec. 5th so we can schedule your ride the best we can to get you in the show and off on your way. It is not always possible to do, but we can try. Please plan on coming to the farm at least an hour before your scheduled ride to help get your horse ready. Some of the horses may be used multiple times but you can do your part by being here just in case and giving extra time to a perfect grooming job. MOST IMPORTANTLY……BRING TREATS FOR YOUR HORSE!!! Oatmeal cookies are great because some of our older guys don’t have the teeth for lots of carrots anymore. Cereal, like apple jacks or fruit loops, is another tasty treat. On a business note…we heard some better service project ideas but nothing really confirmed. Please work on this wholeheartedly. Next meeting will be in January since so many of you will be at the show. Morgan is doing a great job getting the email roster up and going. Please contact her and let her know you ARE receiving the emails, then maybe we can figure out who isn’t. She really wants to do a good job and it is not easy getting anything up and going without feedback. Also, remember to invite any horse loving friends to the club. This is for anybody 5-17 yr. old that wants to be around horses and learn. Meeting Sat. Nov 26th 1-3 pm at Fellowship Farm. Come prepared to ride with your clothes and helmets. All participants MUST have their parents sign a liability before they can ride. Bring your service project idea and win a free entry into the horse show on Dec. 10th. Please RSVP Morgan at cheekma@gmail.com or Tami at tamibatts@fellowshipfarm.net to let us know if we can expect you on the 26th. Happy Thanksgiving! On Saturday, October 29th, we held the first meeting of our chapter of the NCDCTA Junior Club at Fellowship Farm, led by Patrick Marley and Tami Batts. A fun time was had by all. The next meeting is Saturday, November 26th from 1pm to 3 pm. We look forward to seeing everyone there and new members are welcome. Please contact us at 336-697-0605 if you have any questions.